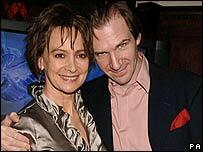 Ralph Fiennes and his partner Francesca Annis are to separate after 11 years, lawyers for the British actress say. The couple met when Fiennes, 43, played Hamlet at Hackney Empire in 1995 and Annis, 61, played his mother, Gertrude. In a statement, solicitors for Annis said: "Ms Annis confirms that she and Ralph Fiennes are to separate." The actress said she was to sue the Daily Mail for defamation and invasion of privacy after it carried details of the couple's relationship. After meeting 11 years ago, Fiennes left his wife, ER star Alex Kingston, and Annis left her partner, photographer Patrick Wiseman. In an interview published last year, the actress said she did not agonise over the age gap between herself and Fiennes. "Ralph and I have been together 10 years now, so whatever happens we have had a very good, different relationship and an interesting time," she said. The separation announcement came on the opening night of Fiennes' new play, Faith Healer, at the Gate Theatre in Dublin. The star is due to attend the Bafta awards in London on 19 February, where he has a best actor nomination for his performance in The Constant Gardener. Fiennes has been nominated for Oscars for Schindler's List and The English Patient. Annis has earned several Bafta nominations for her TV work and is an acclaimed stage actress. She has appeared in films including The Libertine and Dune.